“Nice and thick and lush green, we will be ordering 700 sq metres more once the season is over”. They’re very happy with the Kenda Kikuyu turf and to say they will be ordering more in spring is great news, particularly when there were problems at first, getting enough water on the turf after transplanting. This just shows how tough Kenda Kikuyu really is. Kenda Kikuyu from the trials in to photo, has the best winter colour out of common Kikuyu and Village Green. Kenda has similar upward growth to other types of Kikuyu but its horizontal growth is accelerated and its underground growth is much deeper which means the same amount of mowing, but a much greater wear tolerance. It also survives drought better because of the deep underground growth. It is ideal for areas that have extreme wear but want better winter colour than a Couch. Less turf replacement for sporting ovals because of the larger rhyzomes and stolons as well as much more of them. It has a quicker establishment period than common Kikuyu. It is a sterile Kikuyu, a much safer choice for areas near bushland. We have never seen a seed form on Kenda after many years of testing. People have commented that it resembles a well maintained Tall Fescue Lawn in appearance. Like other Kikuyus it spreads fast so is not reccomended near garden beds with no hard edges. Hi I’m Todd Layt the breeder of Kenda Kikuyu Turf. I’d like to tell you a little about this new variety and why it’s such a big improvement over common kikuyu. In breeding Kenda my first aim was to develop a Kikuyu that is not going to spread by seed everywhere. While breeding I had quite a few that would do that but then I listened to what turf farmers, sports turf professionals and home owners had to say. The common theme was they wanted a kikuyu grass that would survive better those excessive wear areas. Some said while you’re at it what about one that would roll up better, One that was less susceptible to kikuyu yellows disease, one that needs less mowing, is better in shade and one that has much better winter colour. To me that meant testing all the selections in plots to find one that did most of these things. The one I finally chose did all these things except one. It was not significantly more shade tolerant. Even though Kenda grows much faster across the ground, left un-mown it tended to be slightly shorter. Kenda has 4 times as many rhizomes also known as under ground runners compared to common kikuyu and stolons (or runners) that were more than double the length. Up until now many sports facilities used couch as it had more under ground runners but now with the advent of Kenda the job can be done better with all the other benefits that come with it. 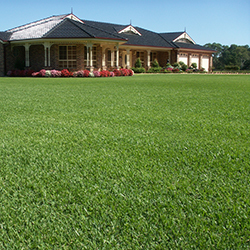 The winter colour of Kenda is the best of any kikuyu, buffalo, couch, Zoysia or any warm season turf. It grows much more actively in winter than all other types. Kenda has shown itself to be very resistant to kikuyu yellows disease. Turf farmers love it because it rolls up better. They no longer have to use horrible netting like you often had to on common kikuyu. Already it has been used successfully on sporting venues, parks and general turfing areas that have ful sun to light shade. There’s a real buzz about this turf from the turf professionals who’ve used it. Now it’s time for the home owner to benefit. If you have a dog or hard playing kids in your back yard then Kenda is easily the best choice. This grass recovers from wear far better than any other lawn. So if you’re looking for a low maintenance lawn for around gardens then look at buffalo or Zoysia but if you want a lawn to survive rampaging animals and people then Kenda Kikuyu is it. Fertilising lawns in winter! Is it more important than spring and summer fertilising? Is it more important than spring and summer fertilising. Most Aussies have been fertilising at the wrong times of the year. Highlighted in research, our relatively warm winter climate, plus our change in turf types are reasons why we should be fertilising in winter, and less in Spring and Summer. This research conducted by Ozbreed has shown – even in frost prone areas – that it’s possible to keep Buffalo, Kikuyu and Zoysia turf green all year round when following optimum fertiliser applications and certain mowing practices. This research has designed recipes to keep these turf types green all year round in many parts of Australia, using specialized fertiliser formulations. Most Australian studies of winter fertilising warm season turf have been conducted on couch turf, which in this study showed poor results. Most USA and other overseas research on winter fertilising has been conducted in regions that reach minus 10 Celsius or colder in winter, yet have warm temperatures for the rest of the year: regions such as Florida, Texas, and Georgia in the USA. In these regions winter fertilising can cause winter kill. In Australia, only climatic regions similar to Canberra, and Armidale get that cold and have the potential for winter kill if fertilised in winter. For the rest, like Melbourne, Sydney (Including frost affected Western Sydney where the research was conducted), Perth, Adelaide, and Brisbane; this research unlocks the true potential of keeping lawns green in winter. In brief, the research involved fertilising replicated plots of numerous turf types with many different timing combinations, using a specialized autumn and winter blend of slow and quick release fertiliser and iron. Earlier research highlighted that a product called 2 Spec Elevate from Globe, provided the best performance for winter colour compared to other fertilisers tested. Large areas around Ozbreed trial gardens were also tested, including shaded areas. Some areas were not fertilised at all, whilst others had either regular Autumn fertiliser, or heavy autumn fertiliser. Parts of these areas then either got no fertiliser in winter, or a heavy fertiliser in winter.